This month I am partnering with myself on a campaign launched by myself for my blog and also for my own shop. If that's not confusing enough, I don't know what is. If you do not know, I recently launched a online store with my bestie. It is a shop beyond any definition. When people ask me, "what do you sell?". I will have a moment of pause to think how to explain to them. The shop brings you all kinds of queer and fun stuff ranging from home décor to beauty accessories. Currently on my online store, the best sellers are the Instagram-loved Mermaid Blanket and Unicorn Makeup Brush. Since I have limited stock for the Mermaid Blanket, I will give away the Unicorn Makeup Brushes. Yay!!!! Go to my online store Facebook page @wanderlustthingsshop and find the post with the photo above. Share the photo on your Timeline and tag three friends. 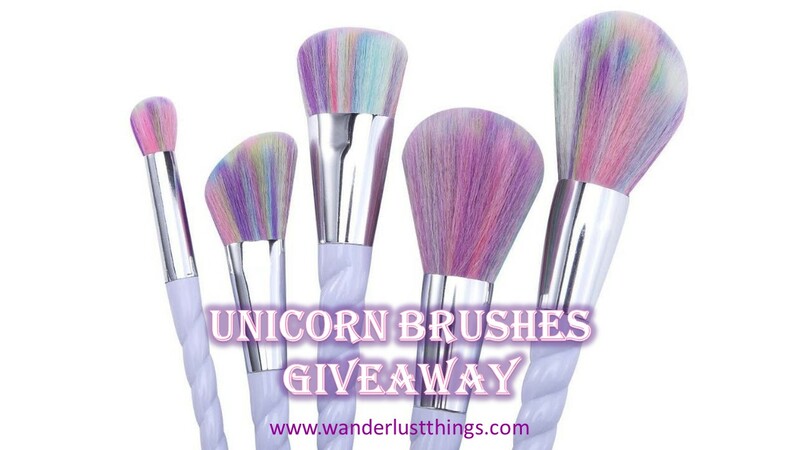 You and one of your lucky friends will stand a chance to win the Unicorn Makeup Brushes. This giveaway is open to all Malaysia residents only. Your shared post must be set on Public viewing (or else we can't check that you already shared it). Wanderlust Things will send to the winner 2 sets of Unicorn Brushes (1 face brushes & 1 eye brushes). You are responsible to share it with your friend at your own cost. Winner will be announced on Wanderlust Things Facebook page on 22nd May 2017. Winner will be chosen through random draw. oh wow nice! Unicorns n Mermaids! Love them! Does the Mermaid Tail Blanket come in diffrent size? Hi Joey. We only bring in one size. The other sizes are not practical. Either too short (for kids) or too long.